How to Drop Middle of the Night Feeding. Different methods of night weaning to use to help baby drop that night feeding and sleep through the night. 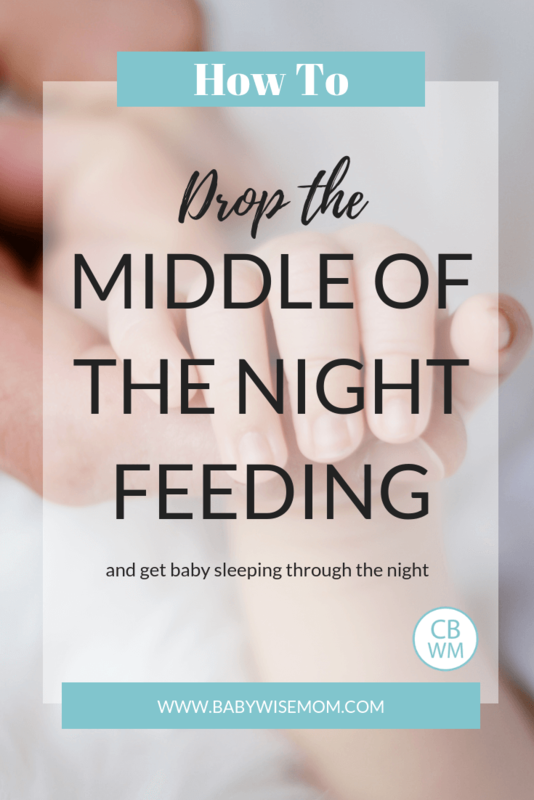 When it is time for baby to drop the middle of the night feeding, you might be confused as to how to go about it. Here are a few options for you to choose among to drop that night feeding. You might try one method and if that doesn’t work after a few days to a week, you can try another one. —–>>>If your baby’s night feeding is really a very early morning feeding, see my post on 5-6 AM Night Wakings. If baby is eating in the night and then not eating well for the first feeding of the day, there is a good chance baby is ready to drop that night feeding. Here are some methods of night weaning you can try. One method is to wait for baby to just drop it without any help from you. Most people start with this method, which I think is the right call. You follow your eat, wake, sleep pattern in the day. You make sure baby is taking good naps and getting enough food in the day. Get your day worked out and your night will follow. Know that sometimes babies will sleep through the night for a night or two, then wake up for a night or two, then sleep through the night, etc. This is fairly common and not a cause for alarm. I would not worry about this until it has been going on for a week or two. Waiting for baby to drop the middle of the night feeding on her own is the easiest method. Not all babies will just drop the feeding without any extra help, however. If you are quite confident baby does not need to eat in the night but isn’t dropping it on her own, a gentle method to try is to slowly wean from the middle of the night feed. This is a slower method than the ones below, but it can be a nice way if you are not fully confident baby does not need to eat. Your baby might not need a full feeding at night, but isn’t quite ready to make it the whole night without a feeding. The idea in the slow wean is that each night, you feed baby a little less in the night feeding. If you bottle feed, you can do 1-2 ounces less every 1-2 nights. If you breastfeed, you can decrease the amount of time baby eats. If baby typically takes 15 minutes to eat, you can do 10-13 minutes night one. A couple of nights later, cut a few more minutes off of that. Continue cutting time off until you get to no time. A great benefit with this method if you are breastfeeding is you won’t wake up fully engorged in the morning. Your body will slowly adjust. Once you are fully confident baby does not need to eat in the night, you do not want to feed baby in the night. When baby wakes, a great method to get baby back to sleep without a feeding is to do an abbreviated bedtime routine. You go into the bedroom, get baby out of the crib, and do your sleep routine. Maybe you reswaddle baby or change the diaper. Maybe you do the Four S’s. You sing a lullaby. Whatever your typical routine is, do as short of a version as makes sense. This signals to baby that it is still time for sleep. Your hope would be that baby will then just go back to sleep at this point, but you may have to move on to the next phase. You might go straight to cry it out or you might try the methods above first. Either way, you are now at cry it out. One of the hardest things about cry it out in the night is you don’t know how long the process will take. Because it is the middle of the night, you worry about everyone in the house waking up. It is usually a good idea to start on a weekend so you are less concerned about other family members waking up in the night. You can also have people sleep in different places if the sleep training is disturbing their sleep. Moms who have used this method typically report it takes 2-3 nights before baby is sleeping through the night without waking. —–>>>Join the Chronicles of a Babywise Mom Facebook Group to connect with other moms who have been there and get advice on how long their baby did cry it out before sleeping through the night. Not all babies will just sleep through the night. Others will need some help getting there. If your baby needs help, try the methods above. If you still need help, see my post What to Do When Your Baby is Not Sleeping Through the Night. —–>>>Find all of my posts on sleep here. 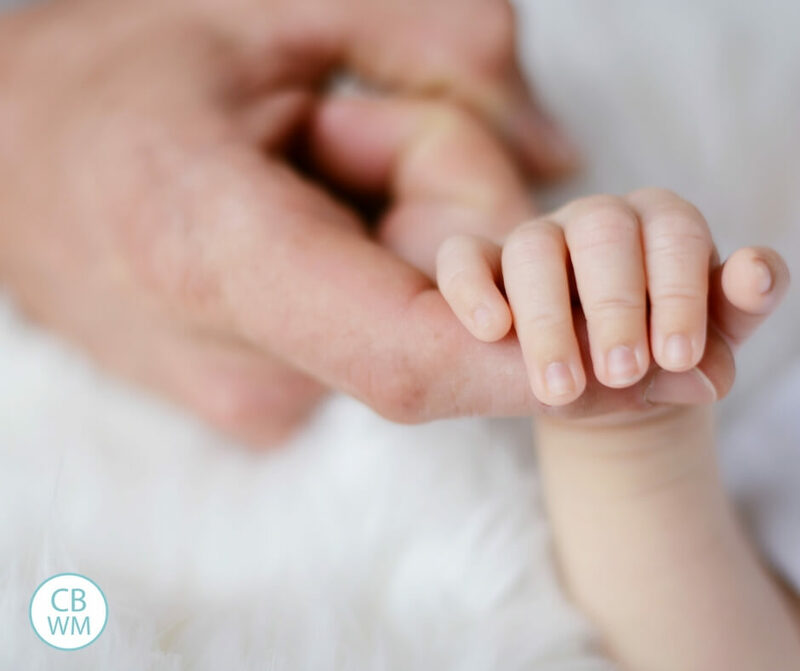 you mentioned above that if your baby sleeps through the night a few times then regresses then sleeps through again and it lasts for more than a week you may have a problem…Im wondering what that problem is and how to address it? thanks in advance! !